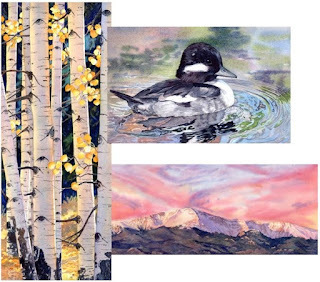 Watercolor Reflections: Time Flies When Having Fun With Watercolor! Time Flies When Having Fun With Watercolor! I can't believe it has been almost a year since my last post to my blog! This last year has flown by and I have decided to make an early resolution to get back to adding a post to my blog at least once a month. I took time earlier this year to update my website, www.LWatryStudio.com, and I have been busy teaching classes, entering juried competitions, and taking workshops. This painting was for my class - "Closeup on Trees and Rocks". 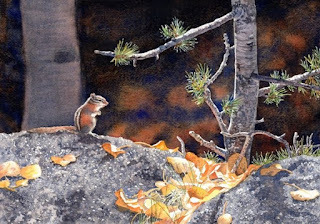 I had taken this picture of a chipmunk among the gold aspen leaves. It fit perfectly for the tree and rock class with the rough textured stone that the chipmunk is standing on. The little tree and the aspen trunk in the background satisfied the tree part of the class. I love the dramatic lighting of the image and the warm glow of the gold leaves. 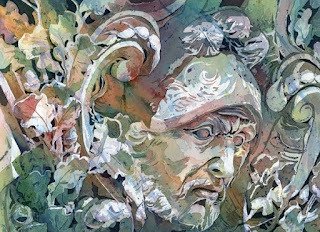 In June, I taught a pouring watercolors workshop and my demo painting was "Through the Ages". 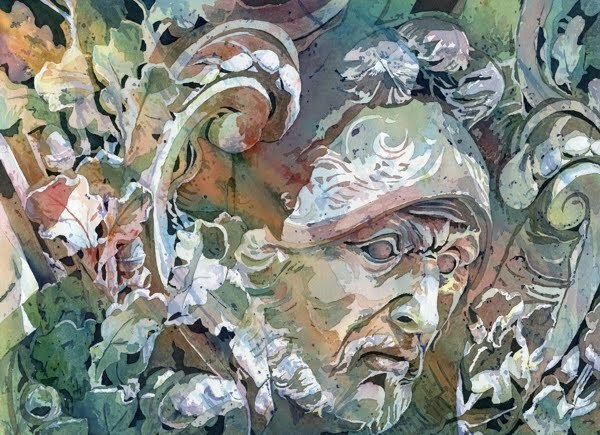 This image came from my photo of a sculptural piece on the side of a building in Paris. The photo was all in grays. For the pouring workshop we masked all of the layers, starting with white and then poured the watercolor. We kept masking the next value and pouring color until only the darkest value was left unmasked to receive our darkest color. After removing all of the masking fluid, I went back and added some texture and value to some of the areas. Watercolors "Show Stoppers", "Bufflehead Duck Reflections"
I also taught an aspen class, a reflections in water class, and a dramatic skies class. My demo paintings for these classes are to the left. If you live in the Colorado Springs area or will be in town, perhaps one of my classes will fit into your schedule. I am also available to give workshops in other locations. I hope you have a very Merry Christmas and a New Year filled with art!